Garden Party Invitation, that's #WhatsOnPress! What's on press at TPI Solutions Ink this week? 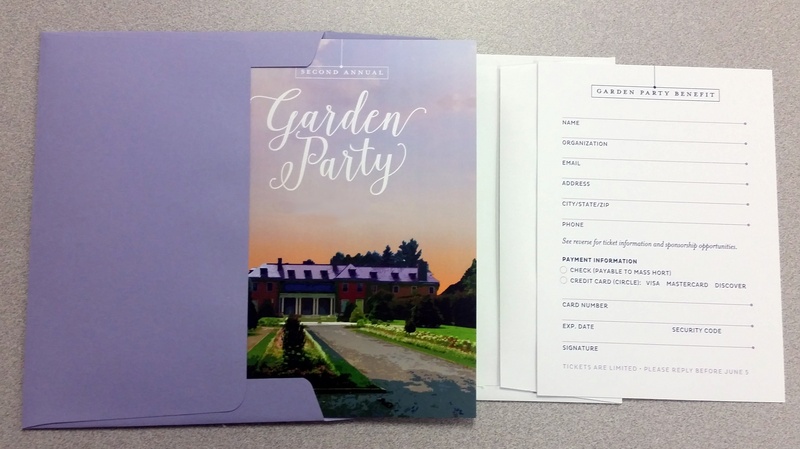 Garden Party Invitation Packages, graphic design by Liz Abbate of Someone Creative in Waltham. The invitation is a 5 x 7 folded card with a 4.5 x 6.25 flat RSVP card, printed on 100 lb. Cougar Cover on our HP Indigo press. The violet A-7 envelopes and white A-6 reply envelopes were printed in PMS 281 on our Hamada offset duplicator. The outer envelopes were addressed with variable data supplied by the client. Our team then stuffed, sealed and delivered the invitations to the client who chose to apply the postage and mail on their own. Do you have an event coming up? We would be happy to give you a free quote on your project.